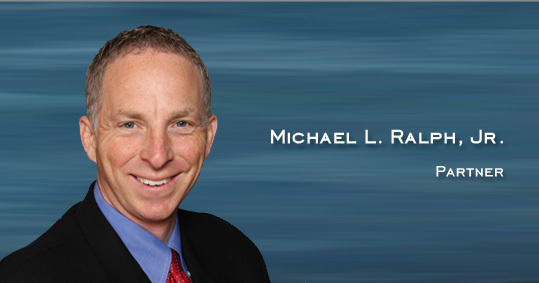 Michael L. Ralph, Jr. has been engaged in private practice, specializing in business, real estate and loan document transactions, estate planning and commercial litigation since 1999. He is a member of the American Bar Association, Illinois State Bar Association, Chicago Bar Association, as well as the Lake County Bar Association. He is admitted to practice in the State of Illinois and the U.S. Bankruptcy and U.S. District Courts for the Northern District of Illinois. Mr. Ralph, Jr. received his law degree from Chicago‑Kent College of Law where he graduated with honors in 1999. Mr. Ralph received his undergraduate degree in Political Science from Indiana University. In addition, he earned minors in Spanish, History and a Certificate in Business. In law school, he contributed research and drafting of an article entitled “Filing Nationwide Perfectly Or Get With The Trend”, authored by Professor Michael I. Spak in the Cleveland State Law Review. The article discussed the filing system of Article 9 of the Uniform Commercial Code. In addition, he also assisted Professor Spak in the preparation of course materials for courses in Sales and Leases, including Articles 2 and 2A of the Uniform Commercial Code; Negotiable Instruments, including Article 3 of the Uniform Commercial Code; and Secured Transactions, including Article 9 of the Uniform Commercial Code.